I have always bristled when someone calls me a hippie. I know I fit some of the criteria – I have dreadlocks, I’m a vegetarian, I used to drive a VW van – but I don’t otherwise fit neatly into that stereotyped box and am not thrilled with the assumptions that go along with it. However, I’m afraid I must report that I might fit another closely associated stereotype: I think I’m becoming a treehugger. The mountain I live on is densely forested with pinon, juniper, and ponderosa, and since moving here I have entered into a new kind of relationship with trees than I had when I was a city-dweller. The ponderosa are tall, majestic, the wise old men of the forest. They are watchful and protect us from the wind and sun. I don’t know how long some of these tallest trees have been there, but I can only imagine what they’ve seen. We have a Lightning Tree, an old tree in the middle of the property that has been struck by lightning and it stands there like a guardian, making sure we don’t get lost. The pinon smells deliciously like the high desert when it burns, and the sticky sap makes a nice salve for cuts on tired hands. I’m looking forward to the pinon nut harvest this fall, as they are considered a New Mexico delicacy. 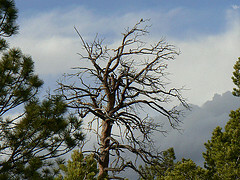 Some of the pinons have twisty branches that give them character, maybe hinting at a sense of humor. The juniper are the most chaotic-looking in their ever-greenery. The others have sharp needles, but the junipers are softer, more gentle to the touch. They have bluish “berries,” which are really seeds. Their wood is strong, and they provide great shade for dogs who want to nap under a tree. All of them provide seats and homes for birds and squirrels, a carpet of needles and sticks to protect from the mud, and a sweet, sweet smell after a thundershower. 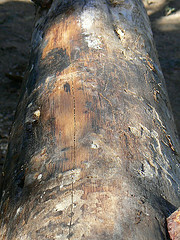 We recently acquired some ponderosa logs for building posts, and I’ve been working on peeling them. It makes me realize how utterly invisible wood is in our daily lives. As I work, I’ve been paying close attention to the grain of the wood, the knots, the holes, pathways, and detritus left behind by creatures like ants and grubs, the creatures themselves, the layers of bark and dried sap and red powdery stuff…its hard to associate this with the rectangular planking of a house or the painted leg of a table, but that’s how it all started out. Trees are great listeners and have an air of wisdom about them. I’m grateful for what they provide, from shade to firewood to a sense of peace. Simply put, I love trees. ~ by Kate Mann on 18 May 2010. I, too love trees and feel their energy when I… yes, hug them, too, like you. Not only that, but I have stood by the Aspen tree in my backyard and hummed to it and cried with it. There is a tender connection there that is inexplicable and deep. AH! Someone who understands this! We have several huge Sweet Gum trees in the front yard and in the Fall they are spectacular. The leaves get all over the neighborhood, inevitably but no one has complained, yet. I seek out the large old trees in the neighborhoods and try to spend time underneath them, meditating or just being with them. I loved visiting N. Mexico and remember well the scent of pinon. I think you have a most wonderful place to call home! I enjoyed reading this very much and learning more about native trees of New Mexico.